138 pages | 35 B/W Illus. Corporate Finance: The Basics is a concise introduction to the inner workings of finance at the company level. It aims to take the fear out of corporate finance and add the fun in, presenting the subject in a way that is simple to grasp and easy to digest. Its aim is to explain – and demystify – the essential ideas of corporate finance, avoiding the heavy use of maths and formulae. The calculations and figures in the book are purely to illustrate fundamental concepts, appealing to readers’ common sense, rather than stretch their ability to do "number-crunching". Through the use of a subject map, this book explains how the key components of the subject are connected with each other, strengthening the reader’s understanding. This book is the ideal introduction for anyone looking for a short yet scholarly overview of corporate finance. Terence C.M. Tse is Associate Professor of Finance at ESCP Europe Business School. He teaches corporate finance at all degree levels and has run numerous executive training workshops around the world. In addition to his advisory role to the EU, Terence has provided commentaries on the latest current economic and financial affairs and market developments in newspapers, on television and on the radio. Before joining the world of academia, he worked in mergers and acquisitions at Schroders, Citibank and Lazard, and in UK financial services advisory at Ernst & Young. He obtained his doctoral degree from the Cambridge Judge Business School, University of Cambridge, UK. 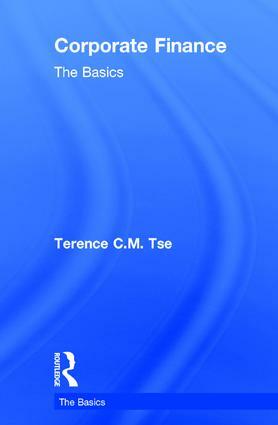 The Basics is a highly successful series of accessible guidebooks which provide an overview of the fundamental principles of a subject area in a jargon-free and undaunting format. Intended for students approaching a subject for the first time, the books both introduce the essentials of a subject and provide an ideal springboard for further study. With over 50 titles spanning subjects from Artificial Intelligence to Women’s Studies, The Basics are an ideal starting point for students seeking to understand a subject area. Each text comes with recommendations for further study and gradually introduces the complexities and nuances within a subject.